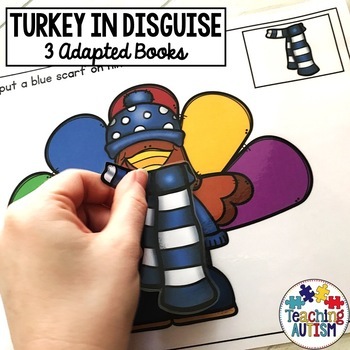 Your students will love these adapted and interactive books to disguise the turkey. It encourages your students to work on their instruction and attention skills. There is an instruction included on top of each page in this book. Students then follow the instruction by helping to dress the turkey to disguise him. 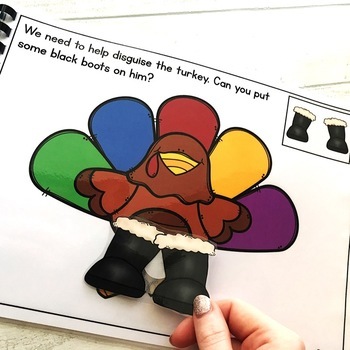 Students will love disguising the turkey in different ways in these adapted books. These adapted books also help your students to work on important life skills. It will help your students to work on their recognition of different clothing items. It also helps your students to work on understanding where items go. For example, putting a hat on his head and not his foot etc. Each page in the books requests students to find a clothing item to add to the turkey's disguise. 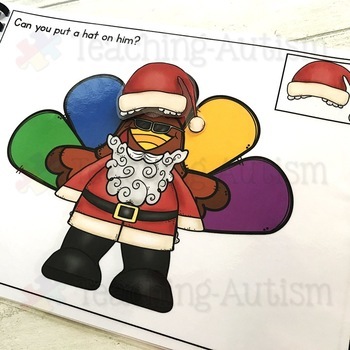 At the end of the book, students can see their turkey disguised in the clothing that they have added. I recommend laminating each of the pages included and bind together as a book. This helps make it more user friendly for your students. It also provides your students with a chance to work on important book skills. I also recommend laminating each of the individual clothing items. This will help to make your adapted books stronger, longer lasting and reusable. These adapted books are a great addition to your Thanksgiving unit. It also provides your students with the chance to work on their sequencing skills. Students will love watching their turkey get more disguised with each page. The activity comes with instructions on the first page for you to follow to set up. The adapted books come in both col or b/w option for your printing preference.